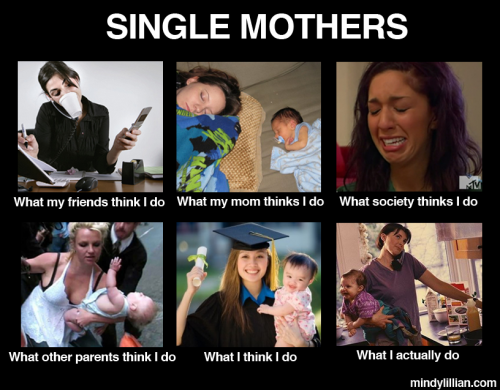 To get a feeling of what it's like to be a single parent, do 200 sit-ups right now. Are you completely exhausted yet? Great! Now, do 200 more. This is what my body feels like most of the time. Generally, my brain power is not at optimum speed either. Instead of lamenting, I like to imagine my exhaustion in a humorous light. A couple of times now I've tried to use my son's set of baby keys to open the front door, or worked myself up thinking that my white blouse shrunk 10x it's size in the dryer when really it wasn't my shirt at all. My best friend admits to putting her 2 year old son's socks on her feet sometimes, wondering why they don't fit. It's 6 a.m., the start of another morning. I've just laid my son beside me in bed. "I want juice, Mommy," he says, so I head straight to the dishwasher for a clean cup. If I pretend I'm not awake yet I don't have to register the feeling of fatigue. "Thanks you, Mommy." I fall peacefully asleep beside him until 7 a.m. My alarm sounds. I decide to snooze for 20 minutes longer. This morning's cuddles are extra precious. This is the best part of my day. We ran out of leftovers last night. I decide that a trip to Urban Fare on our way to preschool will suffice for a packed lunch. My son's clothes are in the dryer, fresh from last night. I need an extra set for the diaper bag so I grab two socks, two shirts, two pants, and one sweater. My son is usually opposed to getting dressed, so it's best to do it all at once and get it over with. It has to be very carefully planned, like a magic trick. I serve breakfast on the table and scoop him into my lap while he's distracted. He thinks I'm giving him a place to sit while he eats. Off with the pajamas, on with the clean clothes. Done. It took two-and-a-half years to be able to do this with ease. It also took this long for my omnipotent dirty laundry pile to evolve into a folded, clean one, at least half put away. I finish getting ready, check that the diaper bag is properly packed. We brush our teeth, put on our shoes and head out the door. "Ding-dong!" I try to prevent my son from pushing the elevator alarm button, but he has a determined personality. He is able to get past my defense for at least one millisecond every morning. About six times a week he sets it off. "I do it! I do it!" My son also proudly attempts to open each of the four heavy doors on the way to the parking garage. We're almost to the car and he turns to me, grinning from ear to ear. This translates into 'I'm about to run full-speed in the opposite direction you want me to'. He's fast enough to run twice around the car before I catch him. I give him a mildly stern talking to about why it's unsafe to run off, put him in the car-seat and we drive off. "I do it! I do it!" My son puts the quarters in the parking meter. It takes less energy to pay at the meter than to use the underground parking. "No running off. Hold my hand, please--" a command worthy of about 10 per cent recognition in my son's eyes. My son has always had strong legs. He runs off at full speed, and I chase after him down the aisles with cottage cheese, yogurt, milk, and applesauce in my arms. His name is Theodore but I like to call him The Wild Theo-boar. Once my son is captured, I herd him back towards the deli. "How much Turkey would you like?" The lady asks. I give her an obscure answer as I'm heavily distracted grabbing my son's coat, hand, leg, and suddenly, the cloud of dust behind him as he runs in the other direction. I run after him again. The lady has my eight slices of turkey wrapped and ready by the time I drag my son -- literally, back to the deli. "Stand up, please," I ask, but he refuses. I'd rather not pick him up because of the injured disc in my lower back and my mild scoliosis, but I have no choice. I carry my squirmy toddler to the checkout counter, so far already exhausted from the day. I put my groceries on the counter, simultaneously keeping my son from disrupting a display of chocolates. I knock a stack of magazines onto the floor and use one hand to put them back neatly. Paying with my credit card feels like a relay race. I rush to make the transaction in the allotted time before my son finds trouble. A great remedy for this chaos is to sit my son on the counter and have him help me stick the card in the machine and push the buttons. It takes extra time though, so this morning isn't one of those times.